We have begun capturing presentations hosted by the Historical Society and related organizations so that they may be viewed online. Please subscribe to our YouTube Channel. There will also be links added to the individual presentations with a short description of each on this page. 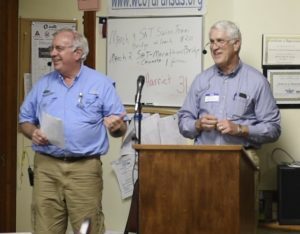 This is one of the presentations from the South Texas Historical Association Spring Symposium that was held in Rockport, Texas on April 6, 2019. The subject was on the history of the railroads in South Texas. 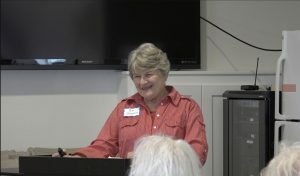 In this presentation Rockport’s own Archaeologist, Pam Stranahan provides insight into how the railroad came to Rockport and the very significant impact it had on the development of the town. Another excellent presentation on the history of railroads in Texas. 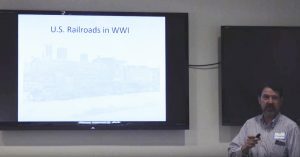 In this lecture, Ken Stavinoha talks about the early Texas railroads and their role in World War I. 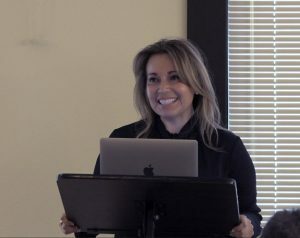 This lecture is also part of the series from the South Texas Historical Association’s Spring Symposium held in Rockport, Texas on April 6, 2019. Naomi Carrier provides education and enlightenment by presenting historical information and reading for us part of one of her plays based on the experiences of African Americans in the early days of the American railroads. It is a special combination of knowledge, wisdom and talent. It was delivered as part of the South Texas Historical Association’s Spring Symposium held in Rockport, Texas on April 6, 2019. 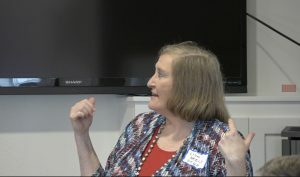 Lisa Neely presents a detailed and informative account of the railroads in South Texas relating to the development of the King Ranch and the City of Kingsville. 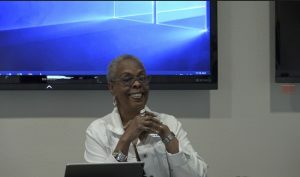 This presentation is part of the South Texas Historical Association’s Spring Symposium held in Rockport, Texas on April 6, 2019. Have you ever wondered where the City of Rockport got its name? In this presentation, Jerry and John go over the fascinating history of the Rockport harbor and waterfront. Presented at the Aransas County Historical Society’s annual meeting for 2019. Don Francisco Yturria was an early South Texas entrepreneur and, arguably, one of the most significant forces in the development of that area during the late 19th and early 20th centuries. 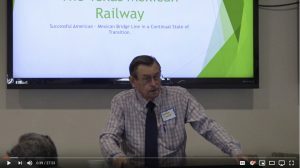 In this video, Lilia Garcia, Don Francisco’s great great granddaughter and professor of history at the University of Texas, Rio Grande Valley tells the fascinating story of his life. Jointly hosted by the Friends of the Aransas County History Center and the Aransas County Historical Society. Presented at the Fulton Mansion Historical Site March 28, 2019.